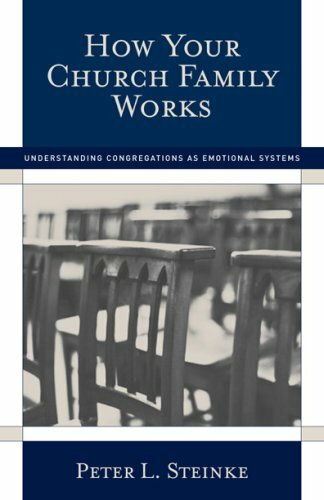 Peter L. Steinke’s How Your Church Family Works: Understanding Congregations as Emotional Systems (The Alban Institute, 1993, 2006) is by no means ‘hot off the press’, but I picked it, and a companion volume, up at a sale last spring, and finally got around to reading it in the past few weeks. I wish I had read it sooner. A lot sooner. Like, when it was first published in 1993. It might have been a game-changer for me. This short (144 pages) work is essentially an abridgement of Edwin Friedman’s classic work, Generation to Generation. Friedman’s book is out of print, and therefore hard to find except through used booksellers. But this is not only a fine abridgement with great application for the church, it is highly accessible. I’ve occasionally heard some pastors say that the church would be a wonderful place if it weren’t for the people. They almost always say it tongue-in-cheek, but there is also a measure of truth to it. The church is people, of course, but it is people who live life after the fall. We, singly and collectively, are sinners. And when you get a bunch of sinners together, there’s bound to be some tension. Every church leader can tell you about some tension that has been experienced; if there hasn’t been tension, growth almost certainly hasn’t taken place, for it is in the crucible of conflict that growth occurs. The tension we experience as the church is often a tension that comes from human interactions, what some call systems. The simplest, perhaps, is person A having a conversation with person B. No problem there, of course, until person A starts talking about person C, who is not party to the conversation, and with whom person A has a beef. Then we have what’s called triangling, where one person (person B) is brought into the conflict that exists between person A and person C.
That might sound complicated, but believe me, it can get worse. Systems and sub-systems exist in churches, and it takes emotional maturity to be able to navigate through the tensions that exist just because people are people, children of Adam and Eve. Steinke’s goal is to help congregations understand themselves in this light, and to rise above the problems that can come about as a result of sinners gathering together with other sinners. One of the key points made by Steinke is borrowed from Kurt Lewin. It says that behaviour is a function of the transaction of personality and environment. When any one of those factors changes, the whole dynamic changes. Steinke doesn’t just elucidate problems, though; he offers solutions. As the book draws to a close, he offers congregations ways that they can be fully aware of who they are and how that is affecting their interpersonal relationships, in an attempt to bring about the greatest degree of emotional health moving forward. And of course, spiritual health is tied into this, because as Pete Scazerro says in The Emotionally Healthy Church, a person (or a church) can only be as spiritually healthy as she, he or it is emotionally healthy. The read is not that difficult; the challenge comes in applying it. I highly recommend this book for anyone in any form of church leadership. P.S. : There is a short YouTube video that helps illustrate the points in Friedman’s theory that will help you understand all this. Watch it here.